Be spoiled while spending the holidays on Anna Maria Island and visit one of the local restaurants for eating out on Thanksgiving. There are plenty of restaurants on the island and surrounding areas that will do the cooking and cleaning for you. Relax and enjoy! You deserve it! If you are planning on gathering the family around and enjoy the holidays together consider these larger Duncan Real Estate properties for your island getaway! Put this brand new vacation rental with fantastic lake views and within minutes to the Gulf of Mexico on your map. Just bring your fishing pole and flip flops! This spacious 3 BD/3 BA ground level home sleeps up to 8 people and accepts pets upon approval. Its split layout is perfect for a larger family traveling with children. Book now! 5 bedroom duplex, sleeping 10. Just across the beach in a great central Holmes Beach location. Close to everything! Book now! Stunning 4 BD/2.5 BA home with private pool. 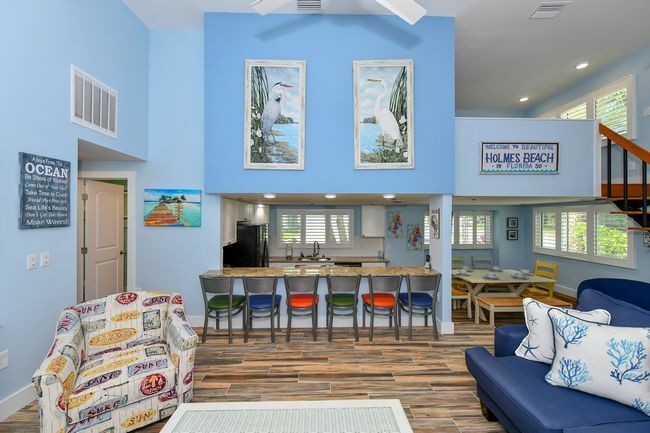 Enjoy the Florida lifestyle inside and out with splendid furnishings and entertainment features. Comes with beach equipment. Quiet side street on North end. Looking to accommodate a larger party? Book Sea Mist next door to sleep 14 in total. Book now! 5 bedroom single family home, pool (heat included), ground level. Spread out and enjoy! Book now! Spectacular 4 bedroom home with pool on Park Ave. Steps to beach! Relax, swim, eat, repeat! Don’t miss out on lower 2018 rates! Book now!